With the Marketing Calendar, you can map out your marketing campaign’s actions in a calendar and share the plan with your team. This collaborative tool helps teams with their planning processes and promotes transparency. 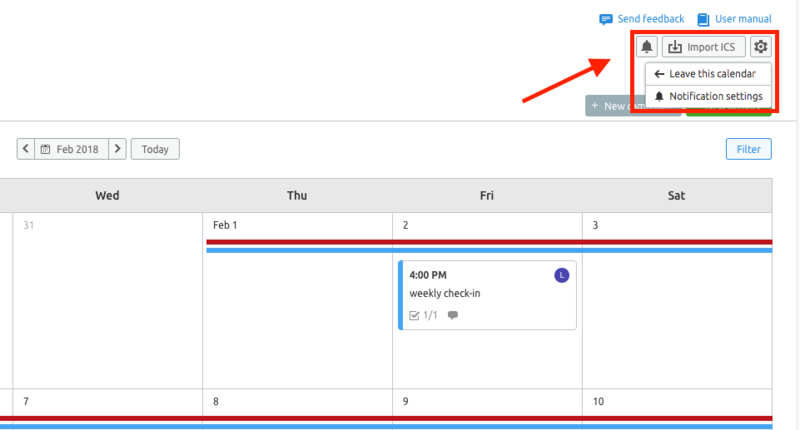 In your calendar, you can organize tasks by creating campaigns and activities. Activities can be given due dates and grouped under the campaign level. Under an activity, you can also configure tasks to be completed. For example, you could have a holiday season campaign for holiday promo activities and a separate campaign for the promotion of a new product or service. Activities would be things like publishing blog posts, sending emails, hosting webinars, or launching a new landing page. As you create more campaigns and activities in your calendar, it may be helpful to filter your view. Filters let you look at only activities for certain campaigns, owners, tagged items, or progress levels. When you add a campaign, you can configure the time (start and end date), write a description of the campaign, attach files from Google Drive, and add comments. The people you share the calendar with will also be able to comment and attach files as well, so this is a good place for setting clear goals and objectives for a campaign. As you add activities to your campaign, they will appear as little blocks to the right of the screen. If your working routine involves running multiple similar campaigns, you can create your campaign structure once and save it as a template for future campaigns. The Save as a template button at the upper right-hand corner of the page allows you to turn the campaign you are editing into an adjustable template that will include copies of all the activities you have added to your campaign. Just as you can customize the settings of a campaign, you can also customize your activities. Add tasks within your activity to create a checklist of steps to complete for the item, attach files, add tags to organize your activities, set due dates, and assign a team member to a certain task. Activity status can be set to three markers: in progress, needs approval, and done. These marks help your team stay on the same page about the status of your campaign activities. The history tab at the bottom will allow you to see all of the changes that were previously made to the tasks. This is perfect in allowing you to stay on top of any changes that were made by you or one of your teammates. You can also create recurring activities within your marketing calendar. You can choose to have an activity recur daily, weekly, monthly or yearly depending on your campaign needs. All you need to do is select the set recurrence button within your activity. 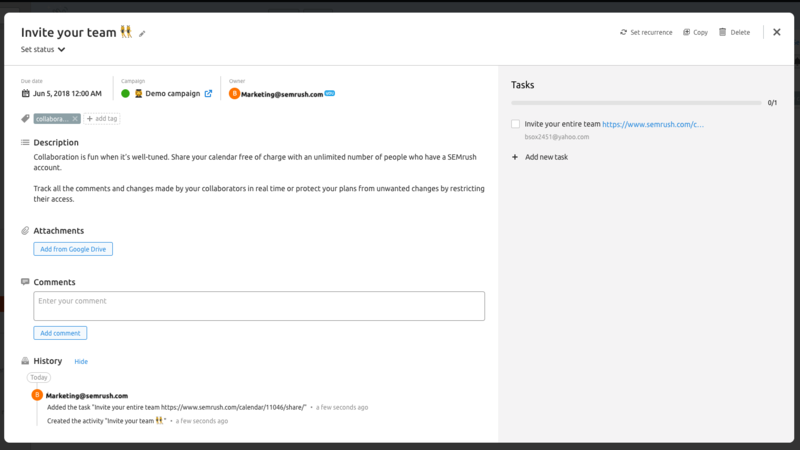 To help your team stay on top of tasks, you can set in-app and email notifications for your tasks, campaign/activity updates, and mentions in comments. This is just another way to stay connected and on top of things as a team! Within the Calendar settings (which you can get to by clicking on the setting gear to the top right of the screen), you can update the name of your calendar, set the timezone, and choose a day that you want your weeks to start on (choose Sunday or Monday). This will update the settings for that calendar for everyone that is shared on it. If you have a paid subscription, Marketing Calendars can be shared with edit access to anyone that has a SEMrush account. They can also be shared as "read-only" with an external link that can be viewed by anyone - with or without an SEMrush account. Click on the “Share calendar” button and you’ll see that you have two options for sharing: Invite members and External link. Enter the email address of the account you want to share your calendar with. On the Invite members page you’ll also see the current list of people that you are sharing your calendar with. If you provide edit access, your teammates will be able to do almost everything you can do; add and edit campaigns, add and edit activities, upload files, comment on timelines, and more. With the External link option, SEMrush provides you with a unique link that shares your calendar (read-only access) with anyone that has the link. In order to share calendars with read-only access, you need to have a paid subscription. With a Business subscription, you can also create more than one calendar. This way, you can collaborate separately with multiple teams within your organization and practice transparency with your clients or management. If you wish to leave a calendar that you are shared with you can do this by clicking on the settings gear in the top right. ICS is a common extension for iCalendar files, which can be used to send calendar files. 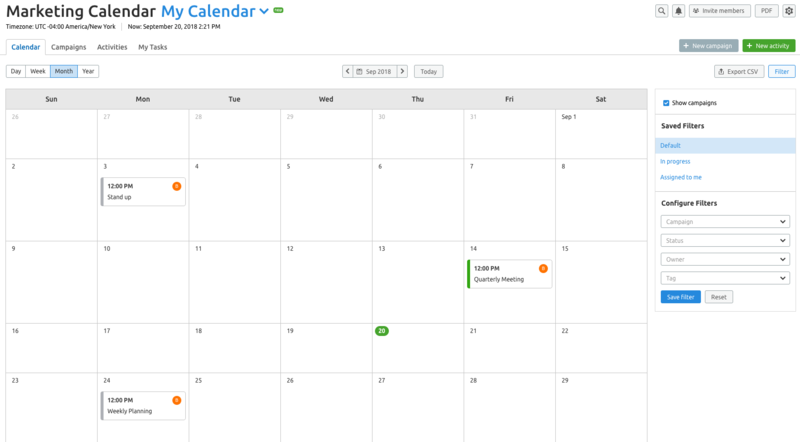 The extension is supported by several tools, such as Google Calendar and Apple Calendar. If you already work with a calendar software, you can export a .ics file and upload your information directly into the Marketing Calendar on SEMrush. To export your tasks and events to a CSV file, click on the “Export CSV” button located at the top right of your calendar. Your exported file will have all of the activities from the month you are viewing so you can keep a record of your past campaigns for future reference. You can also link campaigns in the Marketing Calendar to your real campaigns in Google Analytics by using UTM tags to track the traffic data. This feature allows you to see how well your current campaigns are doing without needing to leave SEMrush. You can connect UTMs on the Performance tab in the Calendar. Only a Calendar owner is allowed to connect GA.
You can see the metrics from the campaign start date up to today (according to the Calendar). This data will also be available for your collaborators that have access to that calendar.